A lot has been made of tonight's matchup at Amalie Arena between the Tampa Bay Lightning and Florida Panthers. After all, who would have predicted that two teams from Florida would be battling for first place in the Atlantic Division at this point in the season? It's a pretty cool story. People are rightly intrigued by the fact that both squads from the 'Sunshine State' have 91 points through 74 games this year, while relying on a bevy of young talent. It's an exciting time to be a hockey fan in the state, to be sure. But, as much as people like to draw parallels between the Lightning and Panthers due to the fact that they both play in supposedly 'non-traditional' markets and are having on-ice success with youngsters leading the way, there's a pretty distinct contrast between the two teams specific to the 2015-16 campaign. It comes down to a pretty simple idea: One of these two teams has had a lot of its success this year attributable to the process, while the other owes a heap of credit to percentages. Consider that the Panthers are currently ranked 20th overall in the NHL's race for the Corsi championship. With a five-on-five CF% of 48.2%, the Panthers find themselves just in front of Columbus and Calgary but behind the likes of Edmonton and almost every team bound for the Stanley Cup playoffs. Obviously Corsi isn't everything, but analysis has repeatedly shown that possession matters. Remember when the Colorado Avalanche were the flavor of the month despite rocking brutal possession stats? They fell back down to earth. How about the Maple Leafs? They crashed, too. Now, I'm not suggesting that the Panthers are going to come crashing down like either of those two teams - they have too much incredible young talent to do that - but I am not afraid to argue that there's some smoke and mirrors going on when it comes to their success in 2015-16. They have the makings of an elite and dangerous squad, just like the Lightning did a couple years ago, but I'm not sure they are there quite yet. Given that their possession stats are really unimpressive, to what do the Panthers owe their success this season? Again, it comes back to percentages. 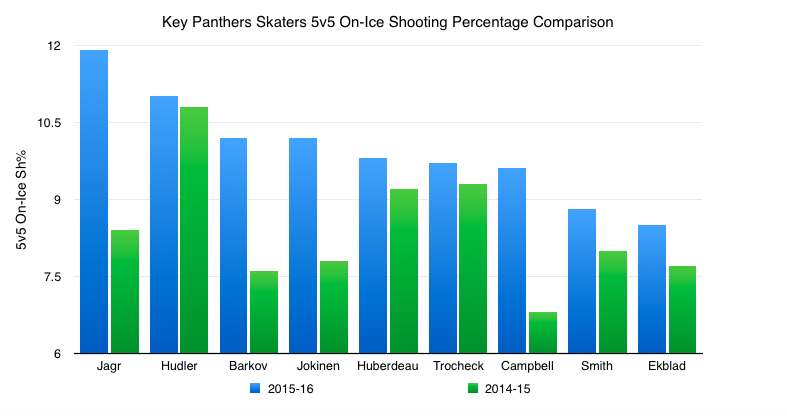 As an example, the Panthers' PDO paints a picture worth sharing. Their 5v5 PDO this season is 101.62, which is sky high and probably unsustainable over the long term; only the New York Rangers are clicking along with a better PDO this year. As the article linked above notes, PDO is calculated as the sum of save percentage and shooting percentage, two largely luck-driven statistics. One argument I've seen from Panthers fans re: PDO this year is one that states that Roberto Luongo is really good and has been consistently good for a long time, so their higher PDO isn't necessarily unsustainable. But, a quick look at the numbers reveals that Roberto's very impressive save percentage isn't what's driving the team's PDO train right now. Their 5v5 save percentage (.9306) ranks 11th overall in the league, which is good but not outrageously above the pack; in fact, Tampa ranks ahead of the Panthers in that category this season (thanks, Bish!). Instead, it's the Panthers' shooting percentage that has helped propel them to the top of the Atlantic Division this year. And, quite frankly, it's likely not sustainable even with the mountain of young, elite talent they've got on that roster. Only Washington (Hi, Ovechkin!) and the Rangers have higher 5v5 shooting percentages than the Panthers this season. Elite talent can certainly bump that number up consistently, as hinted at with that Ovechkin comment, but when you consider that the Panthers ranked 22nd overall with a 5v5 shooting percentage of 7.27% in 2014-15 and now sit third with a shooting percentage of 8.57%, it's hard not to be at least a little bit skeptical of their ability to keep this going. Again, the blue bar is consistently higher than the green. 2015-16 is the outlier. Now, none of this is to say that the Panthers should be looked at as an opponent that can be walked over with ease. What I am saying, though, is that the Panthers likely aren't a threat for the Stanley Cup until they start possessing the puck more and relying on percentages less. It's true that the Lightning have benefited from a high 5v5 save percentage and shooting percentage both this year and last, but those numbers are/were backed by a very strong possession game. When luck hasn't been on their side, the Lightning have been okay as a result. It's much tougher to win night in and night out over time when the opponent has the puck more than you do. The Panthers might win tonight's game. Heck, they might even beat a team like the Lightning in a short, seven game series. What they will struggle to do, however, is get by four high-quality opponents on any path to the Stanley Cup. Teams driven by PDO simply don't walk away with the championship in today's NHL (See: Kings, Los Angeles and Blackhawks, Chicago as examples). To conclude, I noted in the introduction to this blog that lots of people are drawing similarities between the Lightning and Panthers right now. A fairer comparison is probably this year's Florida Panthers and the Lightning of a few years ago. The future is certainly bright, but the results the Panthers are generating today aren't backed by a strong foundation. Over the next couple years, this team will likely (read: undoubtedly) grow into a monster. Monsters don't need luck to win. It's not there today, but that aforementioned foundation will come. When it does... look out!